"Prompt and helpful customer service"
Get ready to experience the elation of aesthetic designs with our new launch of brass switch plates. So finely crafted you just can't resist to grasp this treasure. We are passionate about bringing retro touch to our products with modern styling to Recraft your home. 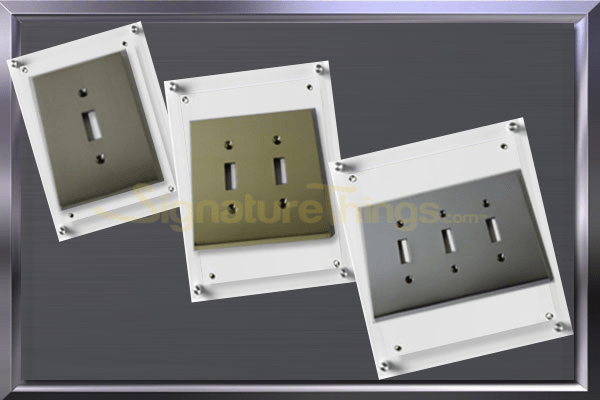 SignatureThings is coming up with latest premium quality brass switch plates with modern style and Discerning in taste. Each and every product is beautifully designed with durability and security taking into consideration. Besides door pulls, push plates or handles, switch plates are also sources of bacteria's which we touch in our everyday life. And as said, if these are made up of alloys or metals like steel, plastic becomes sources of bacteria and we face the health issues because of that. While the brass destroys them in minutes. So our new collection are not just of modern bevel edge designs, but also desirable for your wellness. Product range starts from modern switch plates, decorative switch plate which includes single, double and triple toggle switch plates. Irresistible design of combo toggle switch plate and Duplex cover plate and much more. All our products are available in all finishes and custom finishes. "So switch it on and stay relaxed make each every room in your house crafted with sumptuous design" only at SignatureThings.com.